We’re nearly done with our deep dive into body cam laws around the country. This article will cover the laws of all the remaining states. As always, it’s important to emphasize how important it is to know your rights and the legal obligations of law enforcement. That being said, we’ve seen a clear trend among these laws–they almost all focus on limiting or creating public access to the recordings of body cams and place obligations on police as to the use of body cams. However, what we haven’t seen whatsoever is laws which include legal or evidentiary repercussions for the misuse of body cams by law enforcement. The truth is, there’s a lot of ground left to cover in creating laws to appropriately handle the use of body cameras and a lot of questions left unanswered. Even beyond the lack of repercussions for misuse, there are issues of how the actual recordings will impact search procedures. For example, a well-known rule of constitutional search and seizure is that there is an exception to warrant requirements for things in plain view of an officer. However, there is a difference between visual plain view and the ability to review a recording of something later. Everything on that recording would likely theoretically have been in plain view, however there is an obvious distinction here. We’ve seen some laws already which limit the police’s ability to review the recordings they make as an invasion of privacy issue. However, the issue is largely unaddressed. This is just one example of many when it comes to legal issues with body cameras that will need a larger body of law to address. Regardless, this makes it no less important to understand the law that already exists and applies to you. As with the previous articles, we’re going to go through the laws of each state alphabetically to help you learn where your state is on the issue. Several states, such as Texas, have no laws at all or are in very early stages in creating these laws. These states are listed in the previous articles and will not be discussed here. If you don’t see your state on the list, it is one of these states. We’ve already covered up to Illinois in previous articles, today we’ll discuss the laws from all the states remaining states, starting with Oregon. Oregon adopted general rules regarding police body cams early on as far as body cam laws go–back in 2015. Since then, there has been no change in their approach. For the most part, the law requires all police departments to have their own procedures for using body cams and storing the data. This means it’s worth looking into the approach of your local department. Where Oregon law gets a bit more specific is the storage and sharing of recordings. The data itself must all be kept for at least 180 days but, unless it’s part of an ongoing criminal investigation, no more than 30 months. Where a third party holds onto the data, the data stays property of law enforcement. Oregon also forbids the use of facial recognition or other biometric technology in conjunction with the recordings. Videos of police-public interactions are public records wherever release is necessary for the public interest. Any request for such records needs to give a specific date and time. The video produced will always render all faces in the recording unidentifiable. Pennsylvania has surprisingly in-depth laws regarding the use of body cams by law enforcement with a large law on the issue passed just last year in 2017. First and foremost, the law removed the expectation of privacy from any communication in the presence of an identifiable law enforcement officer. In other words, you should always assume an officer is recording you. The Pennsylvania State Police are required to annually publish standards for use of body cams and storage of the materials they create. If you live in Pennsylvania, these are worth looking into. However, they are required to comply with the FBI’s Services Security Policy. The laws also preempt the Pennsylvania Right-to-Know Law–Pennsylvania’s public records transparency law–and provides a very narrow window to access any body cam recordings. The requests must be made within 60 days of the actual recording, in writing to a designated open records officer, specify the exact incident, and the date, time, and location of that incident. Moreover, the requestor must disclose their relationship to the incident. If the incident happened in a home, the requestor must provide the entity of every person in the home during the incident except for people whose identity is not ascertainable such as a burglar with a mask. Even after all this, the agency can deny the request through a written denial in several circumstances. If the police decide that the recording has potential evidence in a criminal matter, information pertaining to an investigation or a matter in which a criminal charge has been filed, confidential information or victim information and the reasonable redaction of the audio or video recording would not safeguard potential evidence, information pertaining to an investigation, confidential information or victim information, the law enforcement agency is required under the law to deny the request. This denial must come within 30 days of receiving the request unless the requestor agrees to a longer time and the requestor may petition a judge to overturn a denial within 30 days of the denial itself. After a request, law enforcement is required to maintain the unaltered footage for at least if it takes to respond and petition a judge regarding the response. These petitions can be dang hard to win, they need you to prove that the rejection was arbitrary and capricious, and that public interest favors a disclosure. Tennessee has one straightforward law regarding body cam recordings, limiting public access to the recordings. The law, passed last year, makes it so that recordings are confidential and not available to the public the video shows (1) minors, when taken within a school that serves any grades from kindergarten through grade 12, (2) The interior of a facility licensed under the state’s Mental Health and Substance Abuse and Intellectual and Developmental Disabilities code or the Health, Safety and Environmental Protection code or (3) The interior of a private residence that is not being investigated as a crime scene. The law in Utah requires all police officers executing a warrant to wear a body camera so long as one is available. As with the last few laws, Utah also requires all their individual agencies to have a body cam policy. Once again, it’s worth looking into your local department’s policies. In Utah, these policies cover essentially all police obligations as to the use of body cams. The law also allows officers to deactivate their cameras while talking to another officer, during down time, when talking to a victim, witness or informant, or if any individual requests they stop recording–this is an option but not a requirement. The cameras themselves must be worn in a visible manner or audible notice of a recording must be given. Officers must give notice of recording, where reasonable, when entering a private residence. Officers are forbidden from making personal use of the cameras or making personal copies of any recording or distributing a recording. These recordings are subject to a balancing test, weighing personal privacy interests versus the public interest in disclosure, when determining whether they are a public record. However, all recordings made in a home count as private unless they depict the commission of a crime, any encounter between law enforcement officer and a person that results in death or bodily injury, the discharge of the officer’s weapon, or any encounter that is the part of a complaint or legal proceeding against a law enforcement officer or law enforcement agency. As of last year, the release of recordings, when made by law enforcement, is governed by the Government Records Access and Management Act–Utah’s public records act. A denial of access can be appealed to a district court. However, the same law also made any recordings in a health care setting, or even including health care related audio, are protected records except for the same exceptions listed above with the addition of an exception for situations where a subject of the recording is asking to release the footage. Additionally, officers are not allowed to turn on their camera in a hospital, health care facility, human services facility, or clinic, unless it’s as part of a law enforcement encounter(E) have been requested for reclassification as a public record by a subject or authorized agent of a subject featured in the recording. Provides that an officer may not activate a body-worn camera in a hospital, health care facility, human service program, or the clinic of a health care provider, except during a law enforcement encounter and the officer provides proper notice. 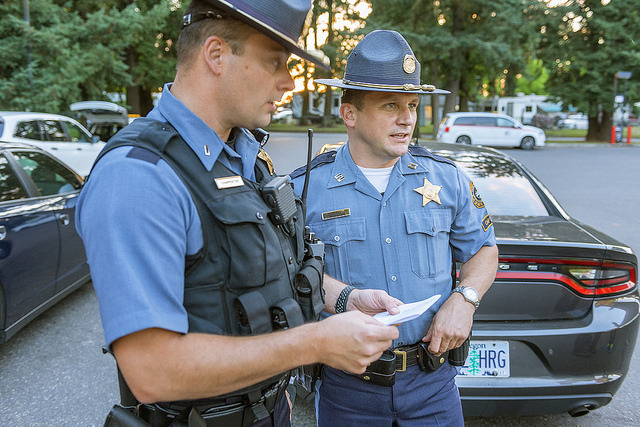 Once again, Washington requires individual departments to develop body cam policies and, once again, it’s absolutely worth your time to find out the policies of your local department. Beyond this, all Washington law on the topic covers how requesting body cam footage works. All requests for a body cam recording from police need to include either a member of the public or officer involved in the incident, as well as a case number, date, time, and location for the recorded incident you are requesting. Any recording is exempted from public record disclosure where it’s necessary to protect a person’s rights–such as when the recording depicts any areas of a medical facility, counseling, or therapeutic program office, the interior of a residence, a minor, a deceased person, or the identity of a victim or witness. However, a person directly involved in the incident requested–as well as their attorney or a civil rights board working with them–have a right to obtain the recording they are involved in. In these circumstances, law enforcement cannot require the requestor to pay the costs of any redaction, alteration, distortion, pixilation, suppression, or other method of obscuring the footage. Finally, we’ve come to the end of the states, and Wyoming has some of the more recent law on the topic–passed only last year. Wyoming law mostly defines what constitutes a police recording as any audio or video data recording on a camera or other device which an officer uses while on duty and is designed to worn or attached to a police vehicle. All these recordings are not available for public inspection under Wyoming law without a court order or permission from the law enforcement custodian of the recordings. The custodian may, but is not required to, allow people to view the recordings if they are of the person requesting the recording, the recording shows deadly force or serious bodily injury, there is a complaint against law enforcement, or the release is in the interest of public safety. One trend you’ve certainly noticed over the course of these articles is that almost all law on this issue is quite recent, 2015 at the earliest. This means that it’s unlikely we’ve seen the end of these laws, they will continue to develop and it’s important you keep track of them to know your rights when it comes to being recorded by the police. This is also the tip of the iceberg in terms of fully understanding your rights, especially when it comes to dealing with the police and search and seizure protections. Look into these protections and potentially even speak to a lawyer on the topic. These are your rights, but they’ll only protect you if you know them.